This wine is a vibrant blend of many different red grape varieties including Cabernet Franc, Merlot, Pinot Noir, and the French-American hybrids Foch, Marquette and Regent. This blend gives the wine a pleasant balance between ripe red fruit and earthy rusticity. It is soft, smooth, and easy drinking. This is a perfect table red for anything off the grill and for hearty pastas. The ruby color of this wine is striking! It has a solid, medium body and fresh berry fruit aromas such as raspberry and blackberry. There are marked oak flavors including vanilla and spice. This vibrant red will be most enjoyable for the next two to four years. The pizza wine! Any tomato based sauce, cooked or uncooked will be a perfect match to the nice acidity, good texture and fruity character of our house red. 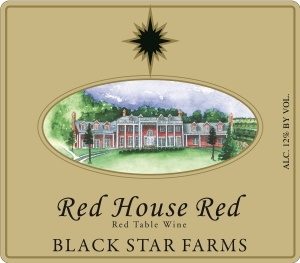 A favorite in my house, Red House Red, is a vibrant blend of vinifera and hybrid varieties. This wine benefits from the art of blending by our winemaking team. Raspberry and blackberry flavors are complemented by a smoky oak finish. From Julia of Bloomington, Indiana on 6/28/2018 . I love this wine! It goes with just about anything and is also lovely to sip in the evening, just because. Blend Merlot, Cabernet Franc, Pinot Noir and a variety of French-American Hybrids.